However, video lottery sales have improved considerably in the past year and are growing at double digits today. 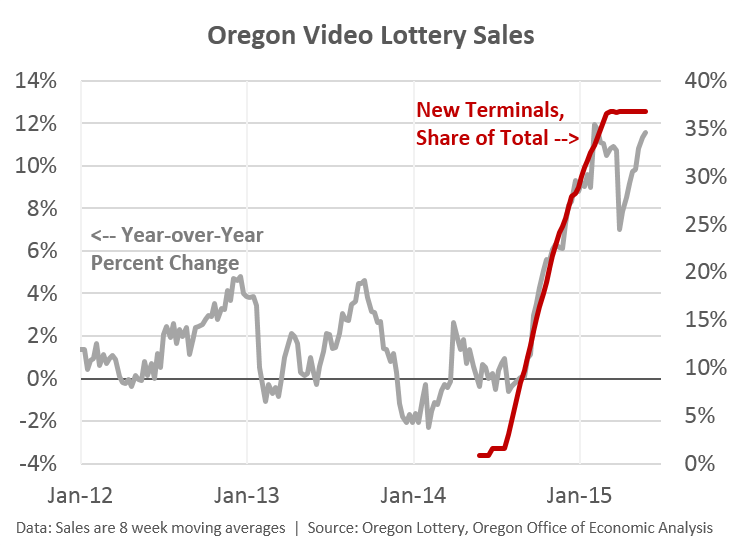 Such gains coincide with the Oregon Lottery’s major capital improvement program which will replace the nearly 12,000 video lottery terminals (VLT) across the state and upgrade the underlying IT system. The first wave of replacements started just about a year ago and finished back in March. Essentially each retailer (the bars, delis and restaurants) now has 2 new VLTs. Over the next couple of years the other VLTs will likewise be replaced. 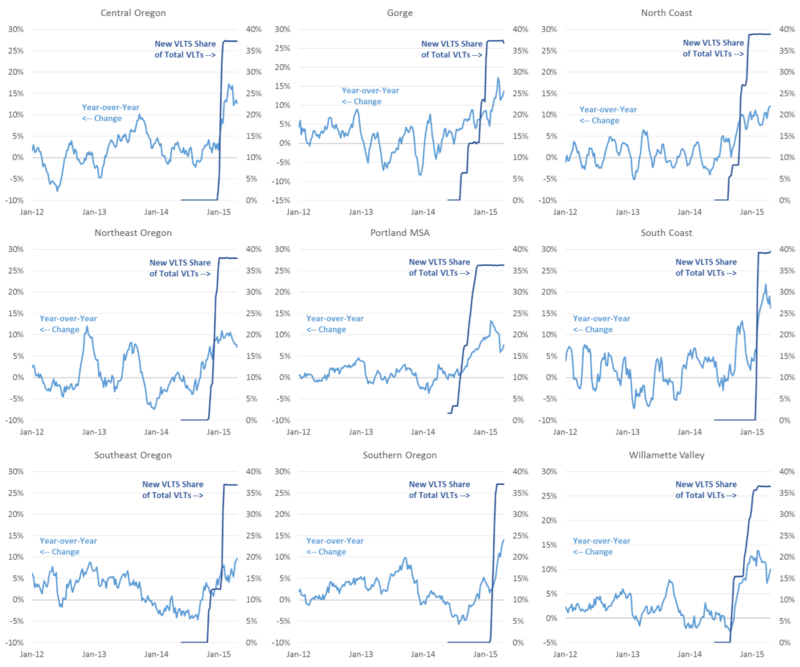 There is no question that a stronger economy supports higher discretionary spending as household finances are generally in much better shape today given the strong job and wage gains seen in Oregon. However, at least in terms of video lottery, the new machines have certainly acted as the catalyst for higher sales. What is interesting is that the response from players can be seen across the state. In most regions, the uptick in sales growth follows the roll out of the new VLTs. Now, before anyone gets too excited or depressed, depending upon your view of the gaming industry, we are still living in the world where spending on video lottery is a much smaller share of income than in the recent past. Sales growth has outpaced income gains in the past year, no question. However the economic improvements in recent years have not fully translated into increased spending on video lottery. Or at least not yet. This was one of our major concerns to the outlook when researching our state by state gaming report last year. 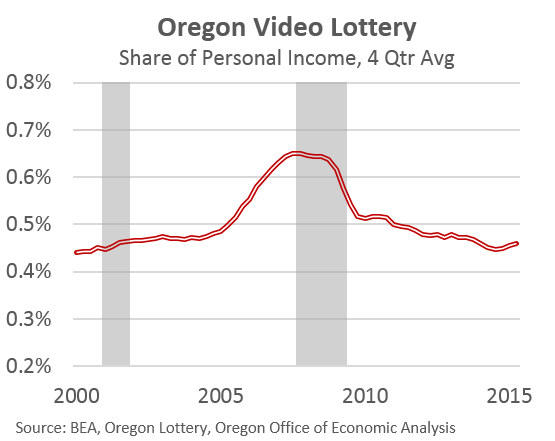 Even with the recent uptick in video lottery sales, when measured as a share of Oregonians’ personal income, it is relatively low when compared to the past 15 years. In terms of the outlook, here’s what our office wrote in our latest forecast document. Due to the continued fundamental improvement in the economy – jobs and income growth – along with these increased video lottery sales, the longer term forecast has been raised from the previous forecast. Growth still remains somewhat subdued relative to pre-Great Recession rates of growth. Such an outlook does leave room for both upside and downside risks. Should the combination of a stronger economy and the new terminals unlock permanently higher sales over a longer period, instead of one-time novelty factor bump, then the forecast will need to be revised up. Possibly considerably so. However, sales growth has been lackluster to disappointing across the country. Even in brand new casinos, after a year or two of strong growth, sales start to plateau or even fall in some locations. Our office’s pessimistic scenario is video lottery growth along the lines of the adult population increase.